Geograph British Isles is a project which aims to collect a geographically representative photograph for every square kilometre of the British Isles. I have contributed about 800 photos (at January 2006), see my geograph profile. One of them is the Guinness brewery in Park Royal, London. In a Geograph grid square discussion on TQ 1982 Crosbie Smith pointed out that the displayed photo shows Moiré patterns. I have put this web page together to investigate. I also noticed that my photo of the Peacock Theatre in London shows Moiré patterns when displayed, so I have included images from this in the discusion. My original Guinness Brewery photo was 2816 x 2112 pixels. It was compressed in my Olympus Camedia C60 Zoom camera to 1336 kb. (link to Original photo of Guinness brewery). 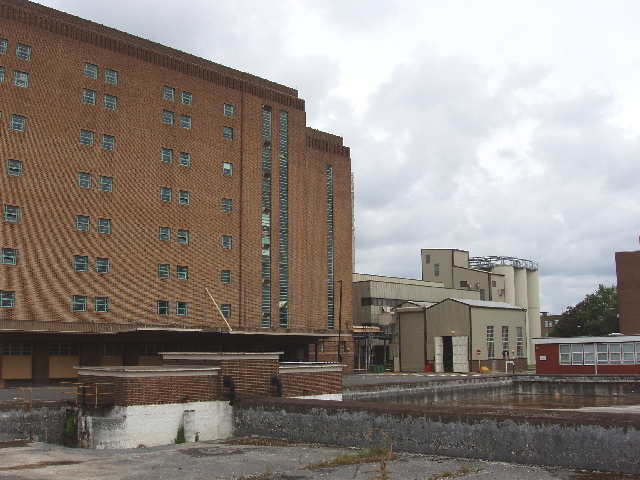 I downloaded it to Geograph, which reduces the size so the longest side is 640 pixels (see Guinness brewery photo as displayed by Geograph). The version above also has a 640 pixel longer side. If I display the original or the 640 pixel version on my computer I see Moiré patterns on the large brick wall. But if I print the original on a 1440 dpi Epson 1290 printer on photo paper, there are no Moiré patterns. I can also display a section of the original photo, detail of wall - 210 kb about 600 x 460 pixels; this does not have Moiré patterns when displayed on my computer. The Moiré patterns are caused by the interaction of the pattern of bricks with the pattern of pixels on the computer screen. The effect of perspective makes the lines of bricks slope relative to the lines of pixels on the screen. What you see will depend on your display. Wikepedia article on Moiré patterns describes the effect. It has a link to an article on removing Moiré patterns. This says that applying blur on a digital photo can reduce the patterns - I haven't tried this. My photo of the Peacock Theatre also has a brick wall at an angle to the camera, so the lines of bricks slope. The effect is not as pronounced as on the brewery photo. As on the brewery photo, if I print from the original the patterns are not apparent. Here are the Original photo of Peacock Theatre - 450 kb, the Peacock Theatre as displayed in Geograph and Peacock Theatre, detail of bricks, 96kb I have seen the effect also on some of my photos of brick churches.